Students achieve more when Kagan Structures are used. Hard data published in peer-reviewed, scientific journal articles reveals Kagan Structures dramatically increase academic achievement.1 But why? Why do students achieve more? In this article, I argue that increased student motivation takes us a long way toward explaining why Kagan Structures accelerate achievement. Students are more motivated to learn when teachers use engaging Kagan Structures. But motivation is much more than just an explanatory tool. Student motivation is an end in and of itself. We want students to be excited about learning. We want students to be curious about the curriculum. We want students to enjoy the process and not just hyper-focused on grades. In this article, I offer student motivation as an overlooked explanation to why Kagan Structures produce student achievement. 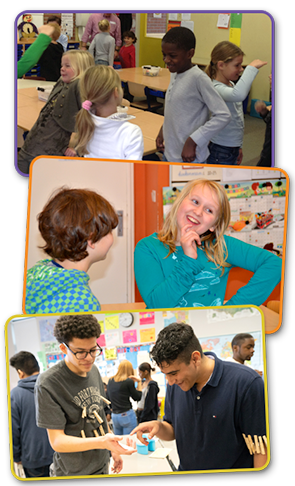 Beyond offering enhanced motivation as an explanation of enhanced achievement, we focus on Kagan Structures as a powerful set of tools to boost student motivation which have positive outcomes beyond accelerating achievement. Each Kagan Structure is designed to implement four powerful principles: Positive Interdependence, Individual Accountability, Equal Participation, and Simultaneous Interaction. Those of us developing and implementing Kagan Structures have long recognized that these four PIES principles enhance both motivation and achievement. They do so because they structure the interaction of students, so students are all more fully and equally engaged. Thus, PIES offers a structural interpretation of the enhanced motivation and achievement of students when Kagan Structures are implemented. We begin this article by reviewing how PIES leads to greater motivation and achievement. Following that structural explanation of the power of Kagan Structures, for the first time we examine seven psychological and brain-based forces released by Kagan Structures which, in addition to the power of PIES, enhance both motivation and achievement. Kagan Structures are designed to include four basic principles, symbolized by the acronym PIES: Positive Interdependence, Individual Accountability, Equal Participation, and Simultaneous Interaction. Cooperative learning theory, research, and practice has shown that these four principles increase achievement in different ways. I have long emphasized the critical importance of having these principles in place to consistently produce learning gains. However, I have never fully expressed how each principle also positively impacts student motivation. Positive Interdependence. The best way to understand Positive Interdependence is to look at its opposite, Negative Interdependence. Negative Interdependence exists when a gain for one is a loss for the others. For example, when the teacher asks a question and five students raise their hands hoping to be called on by the teacher and the teacher calls on one, the other four don’t get the attention or recognition they wanted. A gain for one is a loss for the others. Negative Interdependence creates a classroom where students don’t hope for and encourage the success of others because it diminishes the likelihood of their own success. Positive Interdependence exists when a gain for one is a gain for others. Instead of having students compete to answer teacher questions, we can have students do a Pair Share. In Pair Share, students pair up and quickly take turns sharing their answers. Now, each student has an opportunity to share and hopes for a good answer from their partner as it enhances their own learning. There are no winners and losers. Students feel themselves to be on the same side. Their partner’s response does not diminish their opportunity to shine; it helps them learn. With Positive Interdependence, everyone can be a winner and students encourage each other; with Negative Interdependence winning by one means the others are losers, so students do not hope for or encourage the academic success of their peers. Competition can surely create motivation. It is a powerful force to motivate some. But again, competition creates winners and losers. Students consistently on the losing side opt out of this rigged game. With Positive Interdependence, we replace a motivation-killing force for many with a force where students are motivated to participate and help others—key factors in achievement. Individual Accountability. Kagan Structures include Individual Accountability. That is, each student is accountable for her/his performance—someone will see how well he/she has done. In the traditional whole class Q&A, students who don’t want to participate simply do not raise their hands. Students know they will not be held accountable for answering, so some students choose to daydream rather than focus on the learning. Voluntary participation allows many students to tune out. The more they tune out, the greater their boredom. A boring class is not motivating. In contrast, when teachers use a Kagan Structure, each time a teacher asks a question of the class, each student is called on to answer in front of her/his teammates or partner. All students are held accountable for participating. The structure requires participation and it is much harder to simply tune out. Students are more motivated to participate and pay attention when they know they will be held accountable to partner and teammates on an ongoing basis. Equal Participation. In the traditional class, some students are called on to perform far more than others. Teaching often becomes a dialogue between the teacher and the self-motivated students. But what about those students who don’t have the same levels of motivation? Some seldomly choose to raise their hands to be called; some never participate. With Kagan Structures, all students are called on to perform about equally. Team tasks are structured so every teammate has a role to play. Responses are structured so students have about equal time to share. Research on cooperative learning finds students have improved self-esteem. In a classroom where only some participate, the metacommunication to students is that only a subset of the class is smart or important. In a classroom where everyone participates, the metacommunication is that everyone matters. Students who feel they matter have an important part to play in the team task, are encouraged and praised for their contributions, and are more motivated to participate and learn. Simultaneous Interaction. In the traditional class, students are called on one after another to respond to the teacher’s questions. This whole class Q&A is a sequential structure. Using whole class Q&A, in a class of 30, it would take thirty minutes to give each student a minute to verbalize her/his thinking. 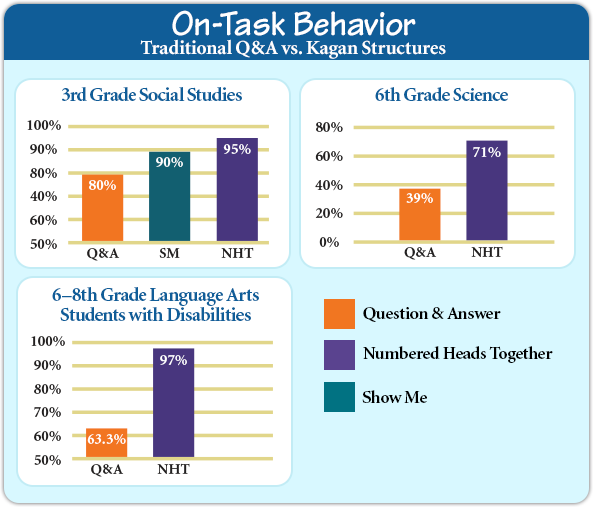 In contrast, Kagan Structures use simultaneous rather than sequential interaction which tremendously enhances the amount of participation and engagement. Going back to our Pair Share structure, half the class responds to their partners at once. Then partners switch roles and the other half of the class shares. To give our class each a minute to verbalize her/his thinking it only takes two minutes. In two minutes using a pair Kagan Structure, we generate as much active engagement as the traditional teacher using whole class Q&A generates in half an hour. Which student is going to be more motivated to participate and achieve: The student who is engaged maybe once per period (but maybe not at all), or the student who has partners, teammates, and classmates counting on him/her to participate? One could argue that required participation creates more participation but does not necessarily increase students’ enjoyment in learning or motivation. To test how motivated students were to learn via traditional vs. cooperative learning structures, experimenters had students review for tests using one of three instructional strategies: whole class Q&A and two versions of Numbered Heads Together. After experiencing all three instructional strategies, experimenters gave students play money and told the students they could spend their money any way they wished on each of three options. 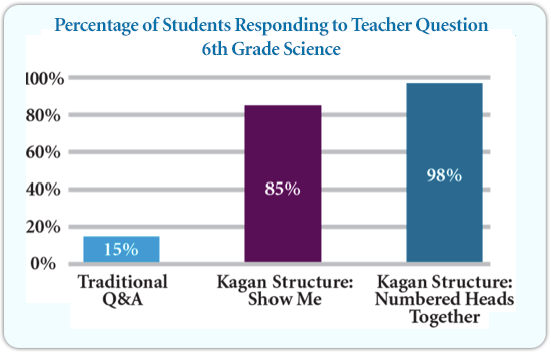 The students spent 79 cents on whole class Q&A and spent an average of $12.30 on the versions of Numbered Heads Together.2 Studies, observations, and student surveys suggest that Kagan Structures are more motivating and enjoyable than traditional teaching. Many cooperative learning structures convert boring solo “drill and kill” into fun, game-like cooperative interaction. Rote memorization is often dubbed “drill and kill” because it kills student motivation. Memorization, however, can be a fun, motivating game. Flashcard Game has students memorize facts and information by winning back their own flashcards from a partner. The game is rich with surprising and delightful praise, and students ask for the opportunity to play the game. Not only is the Flashcard Game more efficient in producing memorization, it creates a high degree of motivation to learn. Quiz-Quiz-Trade is another student favorite. Students each get a quiz card on the subject matter they’re learning. They pair up with a classmate and quiz each other both ways. Then they trade cards and set off to quiz another classmate with the new card. Adding the social interaction component turns rote memorization into a fun, cooperative game. It is easy to mind wander and get off task when working alone to memorize information. Students remain much more motivated to keep on task when the learning is structured to be a fun and interactive game. The brain naturally attends to, processes, and retains novel information. This enhanced attention to and processing of novel information is associated with enhanced motivation. When we see something we have not seen before, we naturally are more motivated to pay attention to it. We have a drive to make sense of it—to see how it relates to prior information and experience. The challenge of making sense of novel stimuli is associated with a release of acetylcholine that enhances attention, pre-frontal and hippocampal activation, and memory.3 We remember novel stimuli. In this way, novelty enhances attention, motivation, and memory. If we always teach the same way, it is monotonous and students become bored and unmotivated. If we always rely on the same teaching strategy, or a small set of strategies, there is little novelty in our classroom. Students are not bored when we use a range of different instructional strategies. By using a variety of cooperative learning structures and introducing new structures, we heighten novelty, interest, and motivation. Kagan Structures transformed my classroom completely when I started using them! My students became fully engaged in whole lessons instead of certain parts. They were able to retain more information than lessons where I did not use any Kagan Structures. Kagan changed the way I taught students and now has changed the way I teach professionals in the learning community! Kagan Structures provide novelty because using different structures changes student interaction patterns; students do not know which structure will be used next. Further, within the structures, students provide each other novel stimuli. We can never perfectly predict what another student will say or do—their comments and actions provide novelty. We touched on increased student engagement in our discussion of PIES. Here, we will dive deeper into how increased engagement boosts motivation. Kagan is a powerful tool that helps to increase student engagement. Students enjoy the structures and some even believe they are “playing games” while they are learning. Increased student engagement leads to an increase in student achievement. When a teacher calls on students one at a time, only one of the thirty or so students in the class is actively engaged at that moment. The rest are spinning gears. And because it is the higher achievers who most often raise their hands to be called on, we end up calling most on those who least need the practice and least on those who most need the practice. Many lower achieving students seldom—or even never—raise their hands and can leave class not having participated, knowing what they did in class makes no difference. This is a prescription for lack of engagement and helplessness. This cannot happen when there is frequent use of cooperative learning structures like Choral Response, Show Me, Pair Share, RallyRobin, RoundRobin, and Three-Step Interview. Those Kagan Structures (and many others) ensure frequent and equal engagement of all students. More Students Respond. To test the amount of active engagement using whole class Q&A vs. Kagan Structures, researchers contrasted whole class Q&A with two Kagan Structures, Numbered Heads Together and Show Me. On the average, 3 of the 21 students in the class raised their hands when Q&A was used (15%); 18 (85%) responded when Show Me was used; and in Numbered Heads Together, when their number was called, almost every designated team member responded (98%). Brains Are More Engaged. In a brain-based approach to evaluating active engagement, we can contrast the amount of activity in the brain when students are listening to a teacher vs. when they are explaining ideas to a partner. The social interaction with a peer produces dramatically greater active brain engagement. 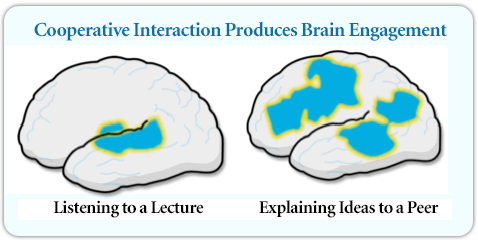 See illustration, Cooperative Interaction Produces Brain Engagement. Time on Task Increases. Another measure of engagement, perhaps the one most often used by researchers, is time on task. Researchers sample specific students in the class or measure time on task for all the students. Studies consistently show Kagan Structures produce more time on task than does whole class Q&A. The results of three independent studies of time on task are presented in the set of three graphs: On-Task Behavior. Teambuilding and classbuilding create safety. Students know they will be included instead of ostracized, complimented instead of put down, encouraged and helped if needed. This encouragement translates into enhanced motivation. Many Kagan Structures have explicit steps that direct students to praise, encourage, tutor, and coach. All of this amounts to a safety net so students know that if they need help, it is at hand. Kagan Structures have students interact in teams of four or with a partner. It is far safer to offer an idea to one’s partner or teammates than to speak in front of the whole class. Many students are shy or are not fluent in English, and the idea of speaking up to offer an idea with the whole class listening, to have all eyes on you, is terrifying. The same students, who will not contribute when the teacher uses whole class Q&A, readily share ideas with their partner or teammates. Safety transforms the brain. Positive emotions boost achievement; when there is no threat, the prefrontal cortex functions more fully. Thinking, creativity, problem solving, and memory are all enhanced by positive emotions via both electrical and chemical changes.7 And of course, when students can perform better, they are more confident and their motivation is enhanced. Students crave social interaction.8 Kagan Structures empower us to parlay motivation to socialize into engaged interaction over the curriculum. The interaction can be as simple as a quick RoundRobin or a Timed Pair Share to have students discuss, “What do you find most interesting about the subject?” Or the student-to-student interaction can be a fully engaging multi-structural lesson. The opportunity to express one’s ideas, hear the ideas of others, and interact in the classroom is a tremendously motivating force. The Kagan Structures offer a full menu of instructional strategies to create interaction and motivated engagement with any curriculum. Infants who fail to get a social response from a caregiver attempt frantic coping methods, and if these fail the infant experiences trauma. Teen males write approximately 2,500 texts a month; teen females write approximately 4,000 texts a month. As students praise each other and do team cheers and celebrates, integral parts of many Kagan Structures, dopamine is released. Dopamine stimulates the attention, motivation, and reward centers in the brain, resulting in more focused attention, and higher motivation, which in turn result in enhanced achievement. Hundreds of research studies establish that cooperative learning increases academic achievement.17 This means students are being more successful at mastering academic tasks. When a student (or anyone) is successful at a task, his/her confidence and sense of competence with that type of task increases. Feeling more competent at academic tasks, students are more motivated to approach and work on academic tasks in the future. Thus, although achievement is an outcome of the motivational forces we have been examining, it is also a major cause. Kagan Structures produce a history of academic achievement which promotes confidence in tackling academic tasks, leading to higher academic achievement going forward. Of the hundreds of research studies demonstrating that cooperative learning boosts achievement, my favorite is an ABAB design examining the impact of using one Kagan Structure to review academic content.18 The research was conducted in a culturally diverse classroom of students struggling in 9th grade science. The researchers examined the daily quiz scores of students for 17 weeks. The quizzes were of equivalent difficulty for all 17 weeks, but the content changed. For the first five weeks they plotted a baseline showing how students were performing using the traditional whole class Q&A for review: Teacher asked a question, students raised their hands to answer, teacher called on a student with a raised hand. For the next six weeks the teacher taught in exactly the same way with one exception: Instead of whole class Q&A for review, the teacher used Numbered Heads Together. Performance on daily quizzes increased from an average of 53% to 75%! To test if that was not due to students learning how to take quizzes or becoming better with the science content in general, for the next three weeks the teacher returned to reviewing the content with teacher-student Q&A. Quiz scores dropped from an average of 75% to 59%. 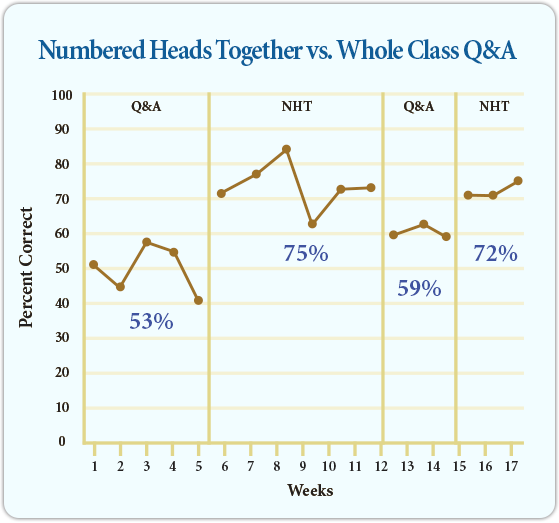 Finally, for the last three weeks of the study, the teacher again used Numbered Heads Together and daily quiz scores increased from an average of 59% to 72%. See Graph: Numbered Heads Together vs. whole class Q&A. One reason I like this study is because, although the differences between whole class Q&A and Numbered Heads Together are highly statistically significant, no statistics are necessary to see that Numbered Heads Together is a better way to review. All but one student had higher quiz scores when Numbered Heads Together was used than when the teacher used whole class Q&A. Although all but one student performed better with Numbered Heads Together, the students differed in how much they gained, ranging from a 5% increase to a whopping 40% increase. The student with the highest gains when Numbered Heads Together was introduced was the lowest achieving student in the class. A student who was slipping through the cracks, failing, turned on and was no longer near the bottom of the class. My favorite student comment: Over 80% of the students agreed that because of Numbered Heads Together, “Other students thought them smarter.” As students interact, they come to appreciate each other more. With whole class Q&A, there is no student-student interaction. The classroom teacher described NHT as effective, feasible to implement, and socially acceptable. It reportedly required minimal preparation time (i.e., have questions, whiteboards, and markers ready). Students learned NHT procedures quickly, and it took little transition time once the structure was in pace. The teacher found students to be more actively engaged, excited to participate, and happy to encourage peers via team cheers. The comments of both the students and the teacher reveal Numbered Heads Together produced heightened motivation. There are many reasons for the academic achievement gains when Kagan Structures are implemented. One non-obvious reason is that Kagan Structures elicit emotion. We know that positive emotion enhances thinking, but it does something else that boosts achievement: it enhances memory. One of the most fundamental principles of brain science is that events associated with emotion are better remembered. 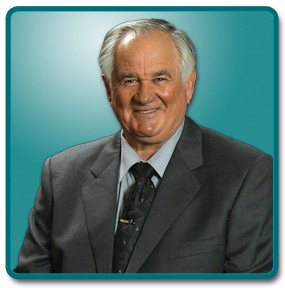 The principle, called retrograde memory enhancement, has been established by a great deal of scientific research. We can, however, establish the principle based on our own experience. If you try to recall events from your childhood, most—if not all—of the events that come to mind are associated with strong emotions. When I ask workshop participants to stand up if they can remember where they were when they heard about the planes crashing into the Twin Towers, almost all stand. When I ask them to remain standing if they can remember where they were the day before, almost all sit down. Why? One event was linked to very strong emotion. If we touch a hot stove, it is adaptive that we remember; if we touch that stove when it is not hot, there is little chance we will remember. Retrograde memory enhancement partially explains the power of Kagan Structures. Kagan Structures elicit positive emotion. See Table: Kagan Structures Elicit Positive Emotion. So the content learned with those structures is better remembered. The content is remembered with no extra effort. Having been successful in mastering academic content, students feel more confident and are more motivated to master new content. Each time a student responds correctly, the student wins his or her flashcard back and receives “surprising, delightful” praise. Students receive praise for every card, either right away if they had the correct answer or after the coaching helps them arrive at the correct answer. Students feel understood and accepted when they are correctly paraphrased. Correct responses receive praise or celebrations. Students are encouraged to use different praise for each question and to elicit surprise and delight. Students feel a sense of accomplishment when they advance to “Solo”—able to solve problems alone that before they could only solve with help. Emotion is generated as students ask and answer interview questions. They feel understood in Step 3, when they are introduced to the team. This structure is often used to have students express their own thoughts and feelings. Students enjoy the uninterrupted attention. Excitement mounts as the spinner is spun to see who will be called on. Students enjoy applause after answering. If we ask students to memorize a list of accomplishments by Ben Franklin, one set of brain structures goes to work. If instead, we ask students to look over the same list of Ben’s accomplishments and infer what kind of person Ben Franklin was, a very different set of neural tracks goes into action—the social cognition network. Memory for the list of Ben Franklin’s accomplishments is greater if we don’t try to memorize it, but instead simply try to figure out what kind of person he was. Whenever we attempt to understand the thoughts, feelings, or intentions of another person—a process called mentalizing—we activate our social cognition network. Mentalizing increases memory, and thus this phenomenon is called the social encoding advantage. These two distinct networks of brain structures actually work antagonistically.19 Thinking about nonsocial, task-related content shuts down thinking about the thoughts, feelings, and intentions of others, and mentalizing shuts down thinking about nonsocial content. We have a social IQ and a nonsocial IQ, but we can’t operate both at once! When we engage social cognition, we actually wake up a part of the brain motivated to learn! Cooperative learning is rich in social interaction. We have students engage in social cognition as they discuss academic content. Our brains are actually motivated to attend to and recall social stimuli, especially the thoughts, values, intentions, and ideas of others. Learned helplessness occurs when a student has experiences which lead to the conclusion, “What I do does not matter; I cannot control my outcomes.” Cooperative learning structures inoculate against helplessness by providing students greater ongoing feedback and support. This immediate and frequent feedback provides a greater sense of control and encourages a mindset that my efforts really do matter. When we assign individual worksheet work, some students do just fine and others struggle. Many students do not have the motivation, knowledge, or skills to complete their worksheet work alone. Some may be embarrassed to ask for help when they get stuck or too embarrassed to admit that they are completely lost. They stare at the problems and fall into helplessness. In the cooperative learning classroom, the teacher replaces individual worksheet work with pair structures like RallyCoach and Sage-N-Scribe. With these structures, students work in pairs and receive immediate and specific coaching on the problems. The probability of falling into helplessness is diminished tremendously with this peer support. Helplessness can also result from making a concerted effort, yet still failing. This can happen when students work independently and think they know how to do the problems when they don't, so they practice wrong. Later they get a very poor grade on the homework. Having a partner on your side who is motivated to help you succeed is empowering. The more we can help students believe that they can become smarter or better with effort, the more we foster a growth mindset. When students have a growth mindset, they are more resilient, stepping up their efforts in the face of setbacks. They achieve more. Through more support and feedback, cooperative learning decreases a sense of helplessness and increases students’ self-belief that they can achieve—because they do at higher levels. We have reviewed seven ways Kagan Structures enhance motivation to achieve. We have treated these seven forces as independent. But they are not. The seven forces interact in ways that magnify their impact: They act synergistically. When synergy is released, one plus one equals more than two! For example, with Kagan Structures, students are more focused on learning; they are more actively engaged; they feel more peer support; their achievement goes up. As we have seen, each one of these forces independently increases student motivation, but combined have a tremendously powerful impact on how much students enjoy learning, each other, and schooling. Taken as a whole, this revolutionary way of teaching is incredibly more motivating than traditional education where students work independently or in competition with one another. Students who have struggled with poor grades and absenteeism in traditional schooling have been turned on to learning when Kagan Structures are used. They are more motivated to come to school. They feel a sense of belonging on their teams. They feel school is a safe, caring learning environment. For some students, one of these forces may have a bigger impact. For many, the forces act synergistically. A final hypothesis I’d like to propose is that these forces act in concert as a “virtuous cycle.” A virtuous cycle is the opposite of the better-known “vicious cycle.” We are all familiar with vicious cycles in education, as when failure leads to diminished future motivation which in turn leads to additional failures going forward. Students who do not excel often tune out and drop out. 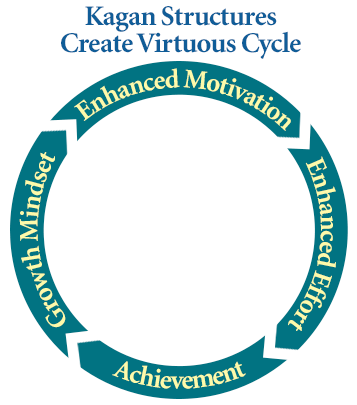 In contrast, the seven motivational factors described in this article create a virtuous cycle. The enhanced motivation and achievement of the first six forces give students experiences that demonstrate that their effort leads them to get smarter—that with effort they can learn to perform tasks that were previously beyond their capacity. Seeing that effort makes them smarter, students adopt a growth mindset which, in turn, leads to enhanced motivation and effort leading to future successes—a virtuous cycle resulting in accelerated achievement. That cooperative learning and Kagan Structures enhance achievement is now well established. 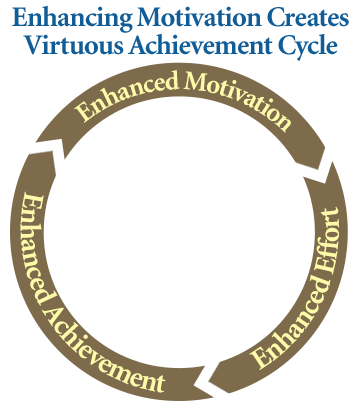 It is quite possible that an infusion of student motivation into learning and achieving is largely to thank for these achievement gains and that the seven forces described herein act synergistically and/or in a virtuous cycle to boost student motivation. Regardless if they act synergistically or in concert as a virtuous cycle, it is clear that students thrive socially and academically with Kagan Structures and that should be sufficient motivation for educators to regularly implement these powerful teaching tools. 1 Haydon, T. Hunter, W. & Maheady, L. Effects of Numbered Heads Together on the Daily Quiz Scores and On-Task Behavior of Students with Disabilities. Journal of Behavioral Education, 2010, 19, 222–238. Hunter, W.C., Maheady, L., Jasper, A.D., Williamson, R.L., Murley, R.C. & Stratton, E. Numbered Heads Together as a Tier 1 Instructional Strategy in Multitiered Systems of Support. Education and Treatment of Children. 2015, 38, (3), 345-362. Kagan, S. Kagan Cooperative Learning Structures. San Clemente, CA: Kagan Publishing, 2013. Maheady, L., Mallette, B., Harper, G.F. & Sacca, K. Heads Together: A Peer-Mediated Option for Improving the Academic Achievement of Heterogeneous Learning Groups. Remedial and Special Education. 1991, 12(2), 25-33. Maheady, L., Michielli-Pendl, J. Harper, G.F. & Mallette, B. The effects of Numbered Heads Together with and without an incentive package on the Science Test Performance of a diverse group of sixth graders. Journal of Behavioral Education, 2006, 15(1), 25-39. Maheady, L., Michielli-Pendl, J., Mallette, B. & Harper, G.F. A collaborative research project to improve the academic performance of a diverse sixth grade science class. Teacher Education and Special Education, 2002, 25, (1), 55-70. McMillen, C., Mallette, B., Smith, C., Rey, J., Jabot, M. & Maheady, L. The effects of Numbered Heads Together on the science quiz performance of a 9th grade class. Journal of Evidence-Based Practices for Schools, 2016, 15(1), 65-89. Slavin, R., Sharan, S., Kagan, S., Hertz-Lazarowitz, R., Webb, C. & Schmuck, R. (eds.). Learning to Cooperate, Cooperating to Learn. New York: Plenum, 1985. 2 Maheady, L., Michielli-Pendl, J., Harper, G.F. & Mallette, B. The effects of Numbered Heads Together with and without an incentive package on the Science Test Performance of a diverse group of sixth graders. Journal of Behavioral Education, 2006, 15(1), 25-39. 3 Teles-Grilo Ruivo, L., Baker, K., Conway, M., Kinsley, P., Gilmour, G., Phillips, K., Isaac, J., Lowry, J. & Mellor, J. Coordinated acetylcholine release in prefrontal cortex and hippocampus is associated with arousal and reward on distinct timescales. Cell Reports, 2017, 18(4), 905-917. 4 Maheady, L., Michielli-Pendl, J., Mallette, B. & Harper, G.F. A collaborative research project to improve the academic performance of a diverse sixth grade science class. Teacher Education and Special Education, 2002, 25, (1), 55-70. 5 Carter, R. Mapping the Mind. Berkeley, CA: University of California Press, 1998. 6 Maheady, et al. Heads Together: A Peer-Mediated Option for Improving the Academic Achievement of Heterogeneous Learning Groups. Remedial and Special Education, 1991, Vol 12(2), 25-33. Maheady, et al. A Collaborate Research Project to Improve the Academic Performance of a Diverse Sixth Grade Class. Teacher Education and Special Education, 2002, Vol 25 (1), 55-70. Haydon, et al. Effects of Numbered Heads Together on the Daily Quiz Scores and On-Task Behavior of Students with Disabilities. Journal of Behavioral Education, 2010, Vol 19, 222-238. 7 Kagan, S. Brain-Friendly Teaching. San Clemente, CA: Kagan Publishing, 2016. 8 Sylwester, R. A Biological Brain in a Cultural Classroom. Thousand Oaks, CA: Corwin Press, Inc., 2003. 9 Brothers, L. Friday’s Footprint: How Society Shapes the Human Mind. New York, NY: Oxford University Press, 1997. 10 Feldman, R., Rosenthal, Z. & Eidelman, A.I. Maternal-preterm skin-to-skin contact enhances child physiologic organization and cognitive control across the first 10 years of life. Biological Psychiatry, 2014, 75(1), 56–64. 11 Brennemann, J. The infant ward. American Journal of Disabilities in Children, 1932, 43(3), 577–584. 12 Tronick, E. The Neurobehavioral and Social Emotioal Development of Infants and Children. New York, NY: W.W. Norfton & Company, 2007. 13 Wire, N. US teen mobile report: Calling yesterday, texting today, using apps tomorrow [blog post]. Retrieved from Nielsenwire in 2010 at http://blog. nielsen.com/nielsenwire/online_mobile/us-teen-mobile-reportcalling-yesterday-texting-today-using-apps-tomorrow. 14 Facebook. Newsroom: Keyfacts. Facebook.com. Retrieved November 25, 2013, from: https://newsroom.fb.com/Key-Facts. (2013, September 30). 15 Chang, S.W.C., Gariépy, J-F. & Platt, M.L. Neuronal reference frames for social decisions in primate frontal cortex. Nature Neuroscience, 2012, 16(2), 243–250. 16 Rilling, J.K. & Kilts, C. Biological basis for human cooperation. ScienceDaily. Retrieved August 1, 2011, from http://www.sciencedaily.com-/releases/2002/07/020718075131.htm. 17 Kagan, S. Kagan Cooperative Learning Structures. San Clemente, CA: Kagan Publishing, 2013. Slavin, R., Sharan, S., Kagan, S., Hertz-Lazarowitz, R., Webb. C. & Schmuck, R., (eds.). Learning to Cooperate, Cooperating to Learn. New York: Plenum, 1985. Numbered Heads Together on the science quiz performance of a 9th grade class. Journal of Evidence-Based Practices for Schools, 2016, 15(1), 65-89. 19 Van Overwalle, F. A dissociation between social mentalizing and general reasoning. NeuroImage, 2011, 54(2), 1589–1599. 20 Lieberman, M.D. Social. Why Our Brains Are Wired to Connect. New York, NY: Crown Publishing Group, 2013, 117–118. 21 Lieberman, M.D. Social. Why Our Brains Are Wired to Connect. New York, NY: Crown Publishing Group, 2013.